Prosthodontists are specialised dentists. They have studied for an additional 3+ years full time after dental school to be able to handle and restore advanced dental cases and provide optimal dental care. On completion of this, they are placed on the specialist registrar in Prosthodontics and officially become a prosthodontist. 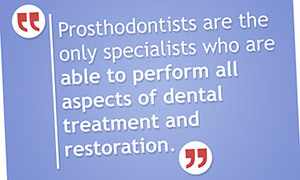 Prosthodontists are the only specialists who are able to perform all aspects of dental treatment and restoration. They are legally able to do anything performed by your general dentist though with advanced training, they tend to reserve their service for more complex treatments as this is the nature of the cases referred by the dentist. They specialise in full mouth rehabilitation, complex restorative cases often involving multiple crown and bridgework and all aspects of implant dentistry. 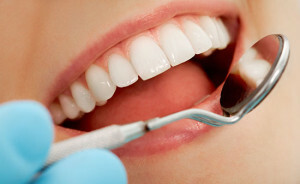 They use the latest available dental technology to provide care to the highest standard. What problems do prosthodontists specialise in? What treatments do prosthodontists specialise in? Prosthodontists like any specialist liaise with your dentist regarding your case. They may be involved in diagnosis, treatment planning, consultations or some or all of the treatment. For example our resident prosthodontist places our implants but the patient comes back to us to have them restored. That said, they will continue with the restoration of complex cases where the soft tissue management is more difficult to manage. As far as dentists go, these specialists are at the top of their tree and often for complex rehabilitation they may involve a number of other specialists such as endodontists or periodontists in the completion and management of cases to ensure the optimum outcome. They will discuss all the options available to you and provide their experience and training in advising you about these and the potential outcomes.